Both our flight maps were created in the past two years. Initially it was only intended for glider pilots, until Werner had the idea to develop a second map. Now there are two editions: a thermal map for sailplane pilots and a valley wind map for hang glider and paraglider pilots. Clearly both maps are useful and suitable for all pilots. Both maps are published as a limited edition and are exclusively available from this website. The maps are printed at the highest quality on 135g/m2 paper and are manually folded. In exceptional cases we will ship the maps unfolded. Unfolded, the map is 1370x480 mm, folded it is 171x240 mm. The great advantage of our maps is the 3D relief presentation of the terrain. 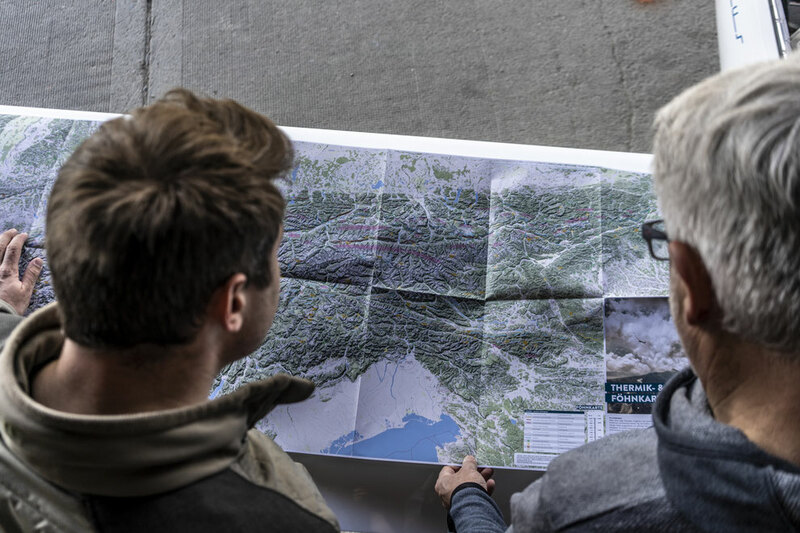 It is only possible to identify and read the terrain, mountains and valleys and plan your cross-country route by using this type of map representation. The scale of the area allows the user to think big at a glance, but also take in the details to work into flight plans. By studying these maps, connections become clear, you focus on the essential and the most important learning goal... "the pilot is able to undertake analysis of the terrain and flight planning" – this will make you an independent pilot. We wish you success and most importantly, have fun flying!